Teachers who work at the poorest schools are more likely to think that computer science is vital to their students futures, but are less likely to think their school boards agree, a new survey released Tuesday reveals. The survey was conducted by Gallup on behalf of Google, and looks at perceptions of computer science for different groups, including students, parents, educators and school district administrators. It follows an earlier survey released in August, which looked at access to computer science courses and found that lower-income students have fewer opportunities to study the subject. However, this latest survey shows that low-income students’ lack of access is not due to apathy on the part of their educators. Twenty-one percent of teachers who work at schools where more than half of the student body qualifies for free or reduced-price lunch said they thought access to computer science is more important to a students future success than other elective courses, like music or art. Only 10 percent of teachers who work at schools where 25 percent or fewer students qualified for free or reduced-price lunch said the same thing. Sixty-three percent of teachers at the schools with the poorest students said they think most students should be required to take a computer science course. Fifty-one percent of teachers at schools with more affluent students said the same. Still, teachers from schools with more affluent students were 13 percent more likely to say that their school board believes computer science education is important to offer in our schools than their counterparts at schools with more low-income students. Brandon Busteed, executive director of education and workforce development at Gallup, called the findings a huge call to action. There are huge discrepancies between the will and the way, Busteed told The Huffington Post. There appears to be more will in these poorer schools but less access. He continued, What seems to be missing here are school boards. There is such little conversation about this at a school board level If I were to say, ‘Whats the one place I would want this data and research to land,’ it would be with members of school boards. They have to look at this and realize their constituents want this in schools. The study also looked at students perceptions of computer scientists. Unfortunately, their ideas of who is good at computer science reflected the fields lack of gender and racial diversity. Males reported being more confident than females that they could learn computer science if they wanted to. 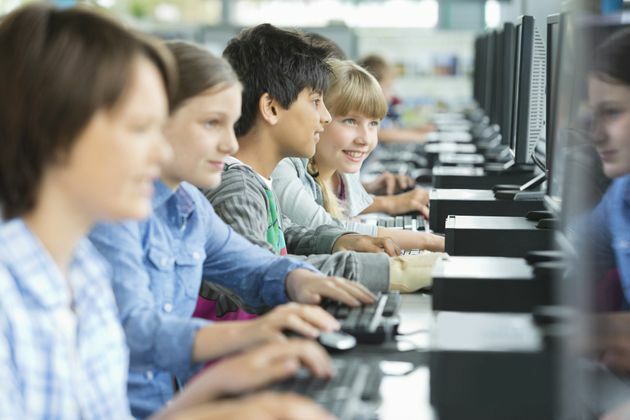 Students and parents both reported that the people they see on film and television participating in computer science are typically white and wear glasses. Unfortunately, perceptions of who computer science is for and who is portrayed in computer science is really narrow, said Sepi Hejazi Moghadam, head of research and development for K-12 and pre-university education at Google. In your popular culture, media, television, etc., that narrow perception tends to be that of [a] white male and someone who is wearing glasses. Even though across demographics they value computer science, the important piece is students often dont see computer science as for them, and it’s further reflected in who is confident to learn computer science, said Moghadam. A majority of employees at Google are white and male. Part of the reason the company commissioned the survey was to learn how to increase diversity in computer science fields, Moghadam said. He also noted the companys other efforts in this realm, including Google’s Computer Science Education in Media program, which works with television executives to feature more female characters in science, technology, engineering and mathematics-related roles.